Fishing has been synonymous with the Cable and Hayward, Wisconsin areas of Northern Wisconsin for centuries. With hundreds of thousands of acres of inland waters to fish, the Hayward Lakes region offers anglers a bonanza of lakes of all sizes (including Lake Superior) and rivers to try their luck on. 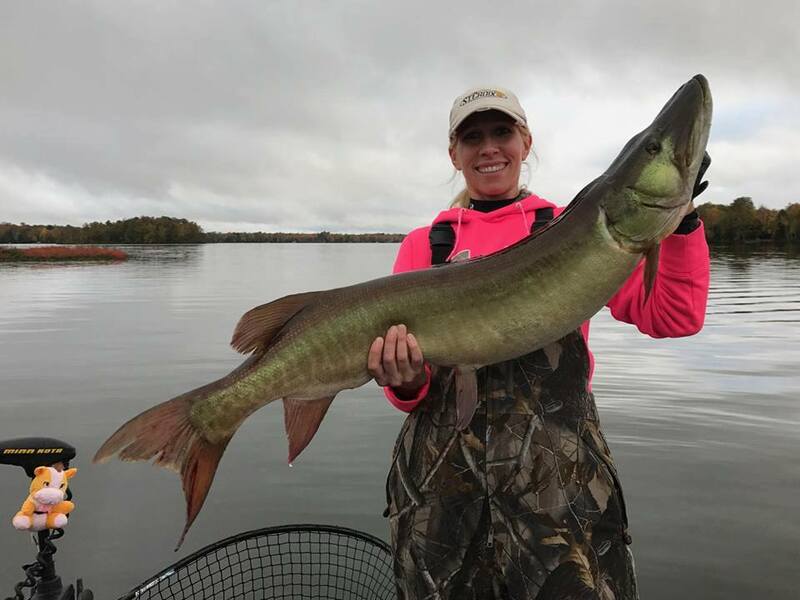 From Chequamegon Bay on Lake Superior in the north to our prized Lake Namakagon in the south, the lakes of Northwest Wisconsin offer opportunities to catch giant musky, plentiful walleye, colorful trout, acrobatic bass and tasty panfish. Bring your own boat, rent one from Four Seasons Resort or hook up with a knowledgeable fishing guide and enjoy a fishing vacation in one of our lakeside fishing cabins! Our cabin rentals include a dock on Lake Namakagon and use of our boat launch at the main lodge. We may even share a fishing secret or two with our guests. 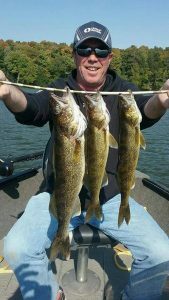 We’re happy to provide the latest fishing reports and tips, and point out less well known lakes to explore in the surrounding Chequamegon National Forest. 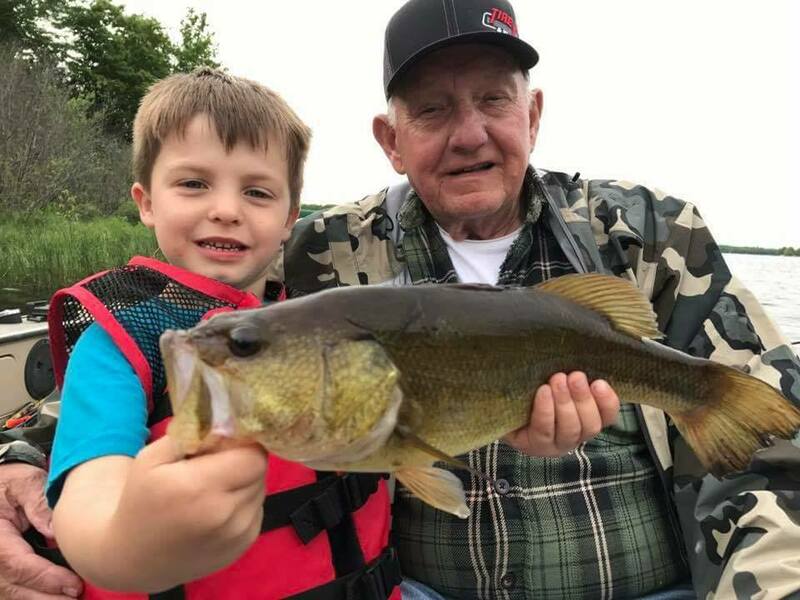 The Hayward Lakes Area still celebrates the importance of fishing to Northern Wisconsin through fishing festivals, museums, tournaments and Friday Night fish fries! And guests at our Wisconsin fishing resort still enjoy spinning a tall tale or two at our main lodge bar after a satisfying day on the lake! Four Seasons Resort is only 20 miles north of Hayward, Wisconsin, the home of the National Freshwater Fishing Hall of Fame. You want to see some lunkers and learn more about the history of fishing in the Hayward Lakes Area be sure to stop and check out the home of the 2-story musky. Lake Namakagon offers great walleye and northern fishing. This 3,200 acre lake is one of only a handful of lakes in the State of Wisconsin that is managed to be a trophy musky lake (minimum size is 50 inches). 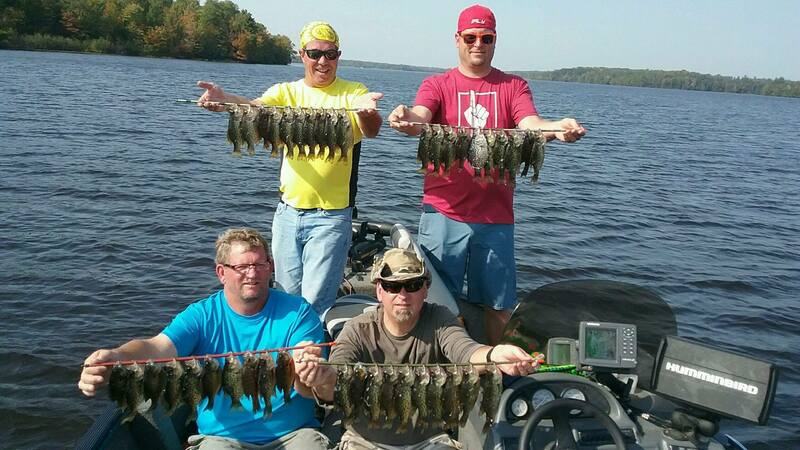 Lake Namakagon also offers good fishing for small and large mouth bass and panfish – bluegill, crappie and perch. 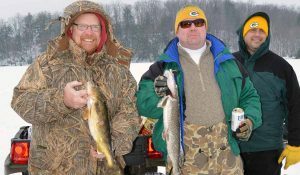 Ice fishing is a popular winter past time on Lake Namakagon. With plenty of good spots right offshore, Four Seasons Resort makes a great home base for ice fishing getaways. 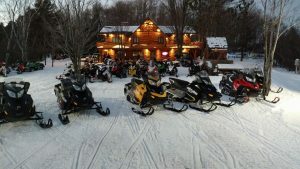 Ice anglers enjoy the convenience of being able to snowmobile to the front door of their vacation home or gather around a warm fire in the main lodge’s beautiful stone fireplace! Lake Namakagon (including its sub lakes Garden, Spring, Jackson) has, for generations, been the four season home for anglers seeking the thrill of trophy musky, walleye, northern, bass and crappie fishing amidst the splendor of nature, in the heart of the Chequamegon National Forest! Lake Namakagon reaches a maximum depth of 52 feet with an average depth of 17 feet. There are over 40 miles of shoreline, with many coves and bays. Lake Namakagon is unparalleled fishing because of its great structure that includes many rock and weed beds, drop offs and sand bars. Lake Namakagon is also the headwaters of the Namekagon River, part of the St. Croix National Scenic Riverway. The beautiful river is inviting to paddle and to fish. From trout waters in its northern reaches to fantastic bass, pike and musky fishing south of Hayward, Wisconsin, the Namekagon River is a true gem and is a popular fly fishing river right in our backyard. Come Fishing in Northern Wisconsin! Grab the family, grab the guys, gather the fisherwomen and join us at Four Seasons Resort for a relaxing fishing vacation. Comfortable, lakeside accommodations on Lake Namakagon await!